September 10, 2018 - This African elephant is on the verge of death. It was likely tusked in its side by another male elephant during a fight. What happens next reveals how enormously important an elephant is to its ecosystem. 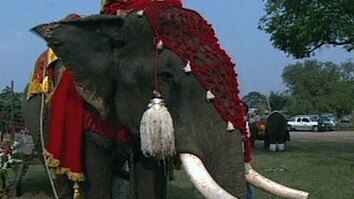 Elephants arrive on the scene to mourn the loss of their fellow elephant. The mourning process includes “body-mounting,” in which they climb on the carcass. They also mourn by walking backwards towards the body, often touching it with their hind foot. They will explore the body with their trunks and front feet. Whether elephants culturally transmit and learn these actions is part of an ongoing study. 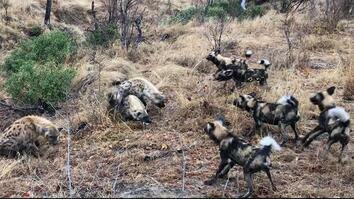 Hyenas arrived overnight and opened the belly of the carcass, tearing through the tough elephant hide. This gives the opportunity for white-backed vultures to feed. Vultures don’t have strong enough beaks to tear through the elephant's hide, so they have to wait in line behind the hyenas. While sad, these deaths are crucial for ecosystems. These feasts can be life saving for vultures, whose populations have plummeted worldwide as humans have changed their habitats and poisoned them. A leopard comes to investigate but decides to eat elsewhere. Elephant carcasses briefly become busy ecosystems of their own. Apart from scavenging, there’s a full community of decomposers like maggots that chow down on anything the bigger scavengers don’t get to quickly enough. A carcass site becomes soaked with blood and fluids that are released during decomposition, creating a fertile patch of ground as microbes release nutrients into the soil. Scientists use carcass counts for keeping tabs on elephant population health. So not only does this elephant's carcass provide a highly beneficial service to the surrounding ecosystem ... it may ultimately help with science and elephant conservation. This African elephant is on the verge of death. It was likely tusked in its side by another male elephant during a fight. What happens next reveals how enormously important an elephant is to its ecosystem. Elephants arrive on the scene to mourn the loss of their fellow elephant. The mourning process includes “body-mounting,” in which they climb on the carcass. They also mourn by walking backwards towards the body, often touching it with their hind foot. They will explore the body with their trunks and front feet. 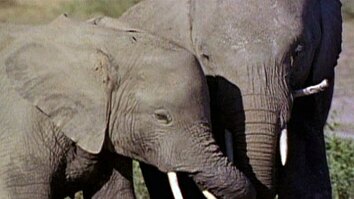 Whether elephants culturally transmit and learn these actions is part of an ongoing study. Hyenas arrived overnight and opened the belly of the carcass, tearing through the tough elephant hide. This gives the opportunity for white-backed vultures to feed. Vultures don’t have strong enough beaks to tear through the elephant's hide, so they have to wait in line behind the hyenas. While sad, these deaths are crucial for ecosystems. These feasts can be life saving for vultures, whose populations have plummeted worldwide as humans have changed their habitats and poisoned them. A leopard comes to investigate but decides to eat elsewhere. Elephant carcasses briefly become busy ecosystems of their own. Apart from scavenging, there’s a full community of decomposers like maggots that chow down on anything the bigger scavengers don’t get to quickly enough. A carcass site becomes soaked with blood and fluids that are released during decomposition, creating a fertile patch of ground as microbes release nutrients into the soil. Scientists use carcass counts for keeping tabs on elephant population health. it may ultimately help with science and elephant conservation.